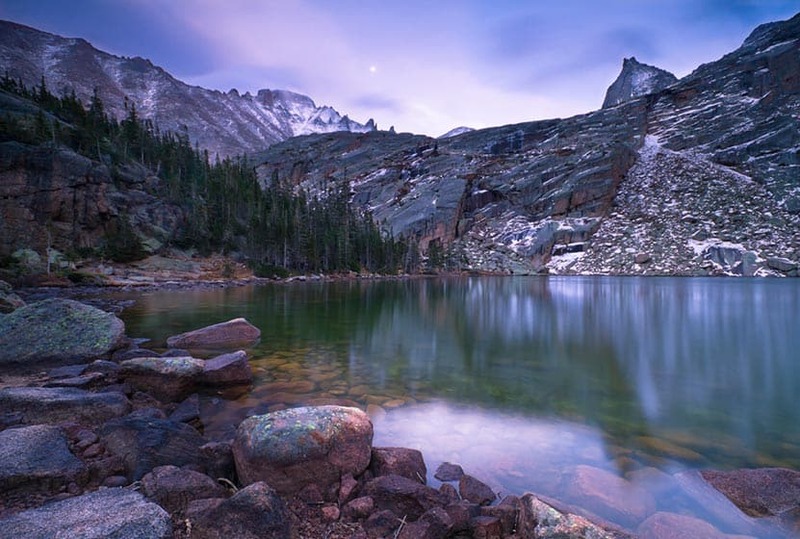 Black Lake is among the most spectacular lakes in Rocky Mountain National Park. 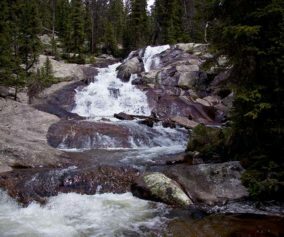 The journey to Black Lake is a strenuous, 10 mile, round-trip hike with significant elevation gain–but both the destination of Black Lake and the several waterfalls along the way make it more than worth the effort. 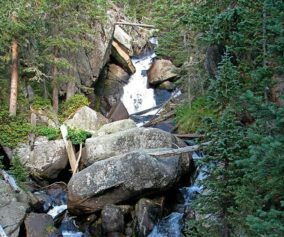 Explore the full Black Lake hiking trail profile for trail map, driving directions, and all the details you need to enjoy this adventure in Rocky Mountain National Park. The trail to Black Lake begins at either the Glacier Gorge Trailhead (see driving directions above), or at the Bear Lake Trailhead (driving directions). Because the Glacier Gorge Trailhead has more limited parking, you may need to drive further up to Bear Lake. There you’ll find a short connector trail that will put you on the path to the Glacier Gorge Trail system. In the event that parking at Bear Lake is full, you’ll then need to park at the Park & Ride near the Bierstadt Trailhead and take the bus into the trailhead. This service runs 7am to 7PM and more information on the RMNP shuttle bus routes can be found at this link. 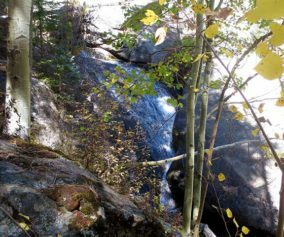 Hiking to Black Lake takes you into the Glacier Gorge Trail system with many wonderful destinations including Mills Lake, Jewel Lake, and Ribbon Falls. Be sure to review the different waypoints and destinations below so that you don’t miss any of the sites. The first destination–and one you can’t miss because it’s right along the trail–is at .8 miles, Alberta Falls. After the waterfall, the trail ascends toward an eventual trail junction. The way to Black Lake is to follow the Glacier Gorge/Loch Vale trail that bears right. This trail climbs steadily for about another half mile until arriving at a second major trail junction with three options. The left-hand trail leads into Glacier Gorge and eventually to Mills Lake. At Mills Lake, the trail follows its eastern shore for about 1/2 a mile until arriving at Jewel Lake, a much smaller body of water surrounded by lush green marshes. The next segment of the trail is my favorite, a challenging stretch of approximately 2 miles that leads hikers across bogs, and through verdant forest where the snow hangs on well into the summer months. In fact, this stretch may prove very difficult in the spring and early weeks of June depending on that year’s weather. The trail continues to follow Glacier Creek up into the higher reaches of the park and ever closer to Keyboard of the Winds, the jagged rock formation ever present against the eastern sky. Keyboard of the Winds is named for the sounds that flow from it’s sharp edges as high winds whistle and roar across its peaks. Be sure to stop and listen for the music. It can be a mesmerizing experience. If snow is still on the ground, then the last bit of the trail may require some basic route finding. The established trail skirts the left/east side of Black Lake, but can at times be hard to find. Stay close to the creek and you should be okay. Soon, hikers will encounter Ribbon Falls, a beautiful slide waterfall. Black Lake is just .2 mile further up the trail. This final segment is steep and requires negotiating some rocks and boulders before coming over the rise to gain breathtaking views of Black Lake. 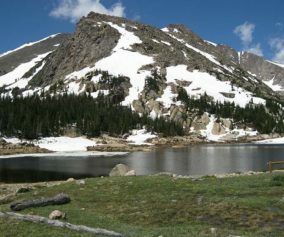 Start Early: The hike to Black Lake is challenging and hikers will want to begin early to avoid being in this exposed area when afternoon thunderstorms often tear through the area in Summer. Photo: We would like to express our gratitude to Erik Page for sharing such an amazing photograph of this hike. 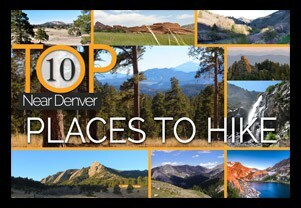 I am visiting Denver and would love some advise on this hike. 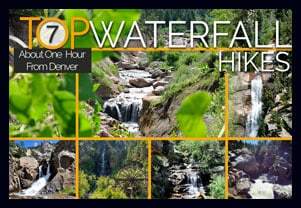 We are avid hikers from Arizona and are looking for a beautiful hike that we can also dip into the water along the way. 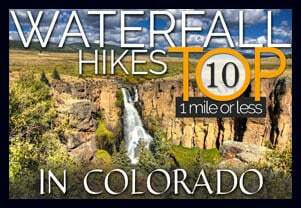 We are staying in Denver and I found all these amazing reviews about Black Lake Falls Rocky Mountains hike. Do you think it will still be covered in snow on July 2nd? Along this hike will we be able to swim to cool off? Thank you so much for your help and we are extremely grateful for any advise you can provide. Great site! Jenny, There is a good chance that there may be some snow; however, it varies greatly from year to year. So, your best bet is to call the park offices at RMNP to ask. 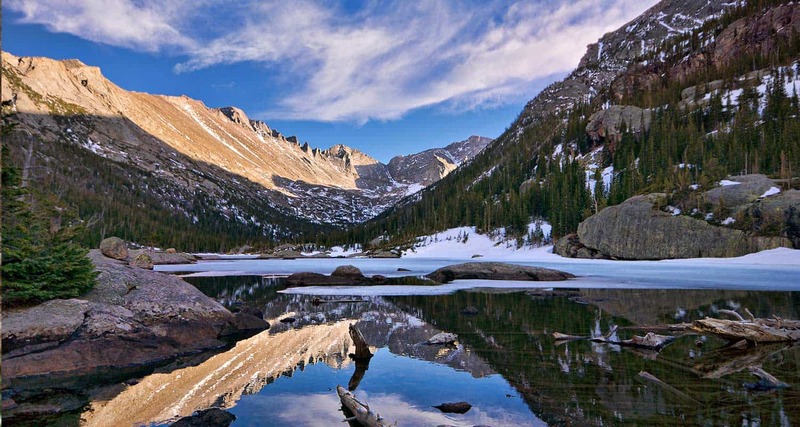 High mountain lakes are very sensitive and fragile ecosystems that are negatively impacted by oils and detergents from human bodies and clothing. Because of this, we advise that hikers practice Leave No Trace principles and minimize impact on these bodies of water by not entering them. I’m sorry that I cannot readily think of other lakes or waters that I’d recommend for wading or swimming.